Jules Mattsson, a teenaged freelance photojournalist, is the subject of many current discussions on freedom of the press thanks to an encounter he had with police officers on June 26. 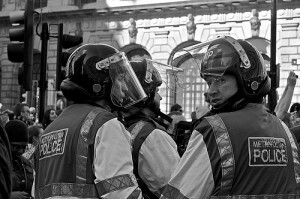 Mattsson was attempting to photograph an Armed Forces Parade in Romford, England, and was instructed by the officers to stop. The confrontation eventually escalated into Mattsson’s camera being confiscated because he was “a threat under the Terrorism Act,” and the Metropolitan Police officers allegedly pushing him down a set of stairs and then detaining him until the parade’s end. At one point, one of the officers even says, “We don’t have to have a law.” Such incidents have apparently been a recurring problem in the U.K. The British Journal of Photography (BJP) has written a string of articles about similar encounters. Even a photojournalist for The Independent was stopped for taking a picture of the House of Parliament. BJP, Amateur Photographer, and other supporters maintain that the stop-and-search measures of street photographers are an abuse of “Section 44” powers, so named for Section 44 of the Terrorism Act of 2000. Mattsson is reportedly considering legal action against the Met. A video that he has made is embedded below and consists of audio from the Romford incident that he recorded on his mobile phone and photos that he took before the officers intervened. You can also check out Mattsson’s Flickr and Twitter accounts. Image by Steve Punter, used under its Creative Commons license. Note: Image is not of the same police officers described in the above incident. Rachelle Matherne has over 17 years of media experience, including print journalism, online journalism and broadcasting. She also has over a decade of experience in online publicity.